MOORE COUNTY The 45-year-old made his first court appearance Monday on eight counts of first-degree murder. He remains in a state prison hospital in Raleigh. Police Chief Chris McKenzie said it was around 10 a.m. Sunday when Stewart started shooting at Pinelake Health and Rehabilitation in Carthage. The little town is about 60 miles southwest of Raleigh. Witnesses say Stewart started shooting in the parking lot and then moved inside the building. He allegedly killed seven elderly residents of the nursing home and a male nurse before he was confronted by Carthage police officer Justin Garner. The two exchanged gunfire. 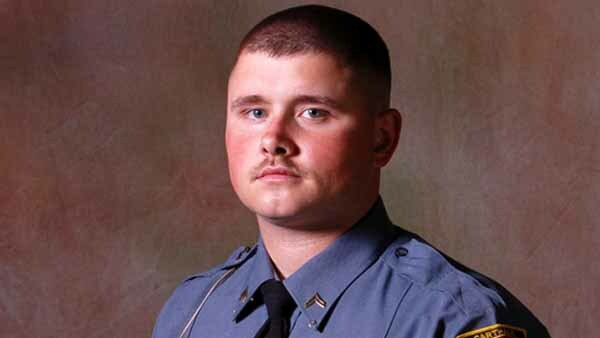 Officer Garner was wounded by shotgun pellets in the lower leg. He shot Stewart in the chest with his .45 caliber service pistol. Police have confirmed that Stewart's estranged wife Wanda Luck worked at the nursing home, but have refused to speculate on a motive for the attack. As Eyewitness News first reported on Sunday, Luck hid in a bathroom and was not injured in the attack. Family members told Eyewitness News that Stewart and Luck had been separated for about three weeks. Court documents show the breakup was part of an on-again, off-again relationship that spread over many years and was punctuated by other failed marriages. According to marriage records in Moore County, a 19-year-old Stewart married 17-year-old Wanda Gay Neal in July 1983. They divorced three years later, and both were involved in several other marriages before they reunited and married a second time in June 2002. Sue Griffin, who was Stewart's wife for 15 years before he and Luck reunited, told reporters that he would often compare her and Luck, complaining that, "Wanda doesn't do it like that." "I'd look at him and say, 'Well, I ain't Wanda,"' Griffin said in an interview Monday. "As time went on, I could tell he wasn't quite over her." Family members also told Eyewitness News that Luck was at the nursing home when Stewart arrived, but that she managed to barricade herself in a room. Stewart worked in the Carthage and Moore County area as a painter. He owns a company called RKS Painting. RKS are his initials. Contractors who spoke with Eyewitness News said Stewart had been contacting them in recent weeks looking for work. He also told them he had cancer. Griffin confirmed that and said in an earlier interview that Stewart had recently started telling family he had cancer and was preparing for a long trip and to "go away." Police have not said what kind and how many weapons Stewart allegedly used in the attack. But, Officer Garner was wounded with a shotgun and Police Chief McKenzie confirmed Stewart had "multiple weapons." Stewart did not have a concealed weapons permit, but he did have hunting permits. He was nicknamed "Pee Wee" by hunting buddies because, one said, he's about 6-foot-2 and 300 pounds. Witnesses inside the nursing home said Stewart was shooting both a "deer gun" and a shotgun. "There's a man in here with a double-barrel shotgun shooting people! White man with a beard," said one caller to 911. Authorities identified the dead as Pinelake residents Tessie Garner, 88; Lillian Dunn, 89; Jessie Musser, 88; Bessie Hendrick, 78; John Goldston, 78; Margaret Johnson, 89; Louise Decker, 98; and nurse Jerry Avent.